Siggi’s tagline is “Simple ingredients, not a lot of sugar.” It is- it’s high in protein (14 grams) and naturally low in sugar (between 9 and 11 grams). It’s incredibly thick due to using 4x’s the amount of milk as other yogurts and straining it. It’s not too sweet and I like that. Here are a few more reasons I’m a fan: it is produced in Upstate NY, uses milk that is hormone-free and has a cup designed to use 40-50% less plastic than other yogurt cups with a recyclable paper sleeve. Siggi’s is also sold at ShopRite and Honest Weight Food Co-Op, though only Whole Foods carries their seasonal flavors (this summer, it is Strawberry & Basil- sounds unusual but is actually quite tasty). Want to try it for free? I’m giving away a 4-pack of coupons to try it for FREE. Enter by leaving a comment below about whether or not you have tried Siggi’s yet. Winner will be randomly selected on 7/31 at 9 PM and contacted by email. Good luck & enjoy! This entry was posted in Contest, ShopRite, Whole Foods. Bookmark the permalink. I’ve never tried it but would love to!! I haven’t tried it yet – but would like to! Thanks for the opportunity! 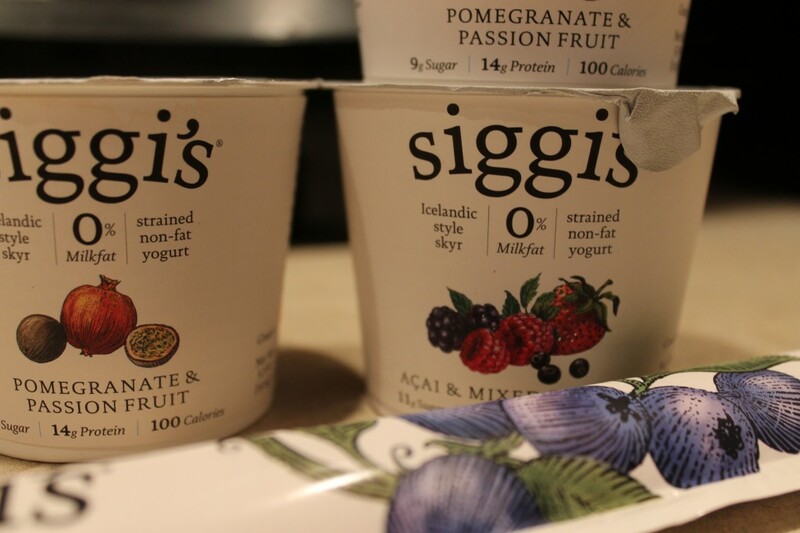 Siggi’s is the BEST yogurt….nothing comes close in taste! I love Siggi’s! I’ve only tried it once, but it was so creamy and delicious and I love that it doesn’t have a ton of sugar. I want to try more, so I’m really hoping to win the coupons! I had given up on flavored yogurt –too much sugar– before I discovered Siggi’s. I love Siggi’s and want to try more flavors! I have not but don’t enter me as I am in Montana and we don’t have Whole Foods or Shoprite here. It sounds really yummy though. I love the eco friendly packaging. I have not tried Siggies yet. I’ve never even heard of it, but I’d like to try it if it is as good as you say! I have not tried this variety yet, I don’t have a Whole Foods very close by. 🙁 I am a big yogurt lover though! They also carry Siggi’s at Stop & Shop, Safeway, Fred Meyer and Super Target stores….do you have near you? No I have not tried it. but would love too…. Yes, I have tried two different flavors, and I do like it very much! Sounds delicious! I haven’t tried these yet, nor have I gotten to Whole Foods yet, but hopefully soon for both. Love yogurt, and love trying new ones! and love that it comes from upstate NY! Yes! I have tried it before! They sell it my local Stop n Shop I think. I tried the vanilla flavor and loved it. Will definitely get more now that it’s on sale. Coupons would be great! Hi Erin! Can’t wait to try Siggi’s! I’m hoping to get the Girls hooked too. Thanks for the great suggestion. I love Whole Foods so happy that We finally have one. I have enjoyed Siggi’s for just over a year now. They used to sell them at Hannaford on Wolf Rd but stopped this spring, much to my dismay. I was so happy to see them at whole foods. AND ON SALE! My favorite is blueberry. I have been spoiled by them. I can no longer tolerate the major brands, they are too sweet. I would love some coupons too!!! I would love to try siggi’s yogurt . Looks like they have many great flavors. I have not tried Siggi’s yogurt yet. I would love to try it because Siggi’s yogurt must be delicious with all of its good qualities that you describe. Yumm! I’m on the search for a reasonably priced delicious local yogurt! I need to try these, I shop at the co-op… I’ll have to look for these.